Today is our last day here in Vietnam. I still don't know how we ended up booking our trip to Mui Ne, a place neither of us had heard of before, but I'm glad we did. In fact, I just wanted another trip to Thailand, just like the one in Hua Hin or the one in Phuket, enjoying the heat in a pool villa while it was winter in Europe. To me, being able to escape the cold winter even if it's just for a few days feels like heaven. These holidays don't make much sense when it's summer in Europe, because by then we have our perfect beachfront house for free! But right now the timing was perfect, we were planning the trip back to Hong Kong for Chinese New Year and I told the hubby we had to go to south-east Asia and relax under the sun with Liam for some days. We still don't know how this happened because no staff ever mentioned and neither did we, but he had booked a pool villa and to our surprise found ourselves checked in at the beachfront pool villa, the best room in the hotel!!! Yay! It is a perfect villa indeed, with a huge garden overlooking the beach. I just couldn't get used to one thing and that is having no shower indoors. I was pretty scared having a shower outdoors at night while I could see some lizards on the wall and I could feel the wind blowing. Oh yes, the wind is really something in Mui Ne. 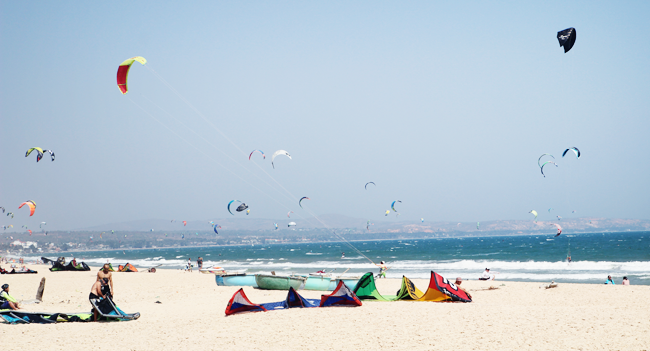 It is a famous region for kitesurfing, as you can see by the picture below! Even though the wind season is August to December, it was still pretty windy now, and that's the thing I liked the least about Mui Ne. Maybe I'm just over sensitive to the wind, because the hubby didn't seem to really care. Mui Ne beach is very pretty, it's a really long beach with extremely soft sand. I can't say I've found the best restaurant in Mui Ne, because there's just so many you'd have to live here for a month try them all, but I'll tell you which was, by far, my favorite from all the ones we tried. It's restaurant Nam Tho, which has two branches, one at number 33 and another at 43. I personally liked Nam Tho I, the one on number 33, better. So that's the one I recommend :) Even though I like Thai food way better than Vietnamese, we have been having some real nice food here as well, mainly the typical Vietnamese dish, Pho, as well as seafood and curry. I'm happy all of us have had such an amazing time. Liam really did have a blast. 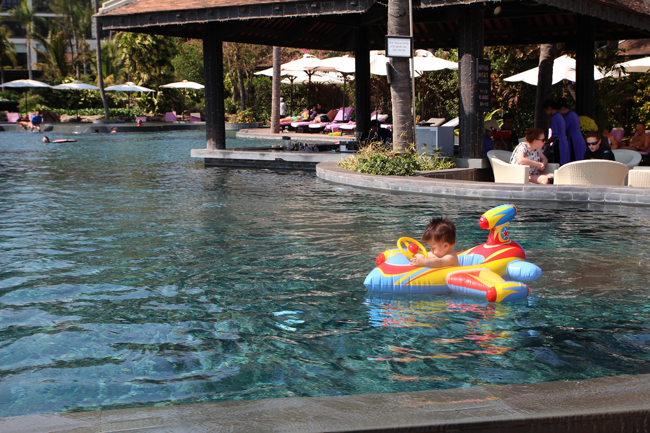 He has been so happy with so many nice activities, and has loved playing with his inflatable plane in the pool, as well as discovering the texture of the sand. I think the timing to travel was perfect, because Liam is not such a baby anymore and can sit by himself and play more, but at the same time he hasn't started on solids yet, meaning that all he eats is my breast milk, which makes it oh-so-convenient! I'm obviously kind of sad to be leaving already, but the Chinese New Year celebrations in Hong Kong are awaiting us, as are three different afternoon teas I'll be enjoying in this coming days. Hong Kong here we come! Liam is so cuteeeeee! lovely pictures and happy chinese new year. have fun in hk! Thanks Eyin! Happy New Year to you too! adorable baby and family, the baby looks like he can be a big star on day. enroll his baby in acting.